Rocrail is free of charge. Just push the OK button to continue without key. If you do not want to see this dialog every time you start Rocview just request a Support Key. 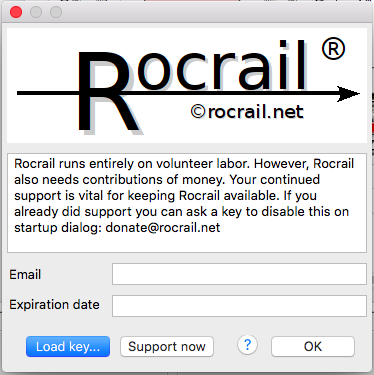 The key may be installed on all your (see below) computers on which Rocrail is running. Your email address will be shown in this dialog so if you send a copy of your key to other persons they will also have your email address. The key expires after one year counted from the transaction day. See How to get a key for a longer duration of validity. 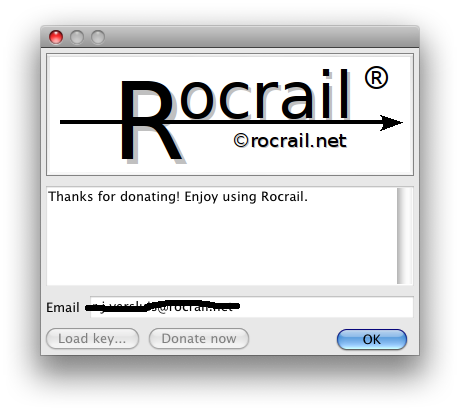 The key will be automatically transferred to the server after clicking the OK button of the Rocrail Ini Dialog (Menu: File → Rocrail properties…). A server restart is required. Some Rocrail mobile clients, iPhone/iPad excluded, will bring a support message if no valid key is available in the Rocrail Server Ini and will terminate. The received lic.dat file can be copied into the working directory of the Rocrail server. If the installed key will expire within 7 days the Support dialog will popup at start up with the expiration date in red. Under certain conditions this warning shows wrongly up on 32 bits systems if the expiration date goes beyond the year 2038¹.